Welcome to the second post in our art-themed wedding series! We started off with boldly geometric Mondrian inspiration. 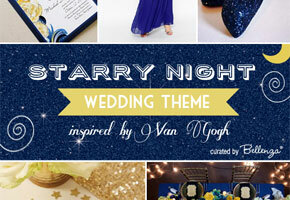 Now we’re back with another Dutch master, Vincent Van Gogh—specifically his stunning painting “Starry Night.” Amazingly it has been the theme for quite a few weddings, splashing its vibrant blues and yellows and its swirling stars across wedding stationery, bridal fashion, table settings and favors! Wondering if you might bring that artistic energy to your own Big Day? Read on! Van Gogh is known and loved for his signature use of color—bold, bright and bursting with energy! And his “Starry Night” is a perfect example. You can channel that into your ceremony and reception details in a tempered, more romantic way while still celebrating the gorgeous sky on your wedding night. Your wedding stationery (1) is an ideal place to bring in a replica image of “Starry Night” painting—whether in your save-the-dates, invitations, ceremony programs, place cards or menu cards. Then, the rest of the elements can pick up on its distinct colors. At the ceremony, imagine the striking effect of your lovely bridesmaids in cobalt blue chiffon gowns (2) and, for you, glittery blue Louboutin pumps (3) peeping out from your wedding dress hem. And as you and your groom exit the venue, a shower of glistening gold-star confetti (4) to celebrate your newlywed status! Come reception time, how fabulous would your tablescape (5) be recreating the Van Gogh work in yellow floral arrangements, blue glassware and glowing candles! While overhead, a lighted garland of paper stars (6) echoes the twinkly theme. For your wedding cake (7), a royal blue tiered creation sprinkled with gold “stardust” would be an elegant choice. And for a fitting signature drink, bottles of wine in customized “Starry Night” labels (8) would be lovely to serve—and maybe to give as special mementos to the bridal party. 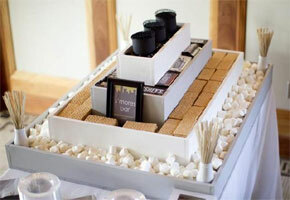 For the signs and labels to grace the cake and dessert buffet, the drinks station or the favor table, stylish ivory frames (10) would provide a perfect touch of glam. And speaking of wedding favors, think of gifts like specially packaged soy candles (9) for guests to take home a little of your memorable “Starry Night”! 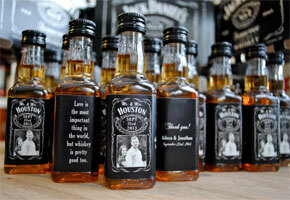 How’s this for a tribute to an artistic master in a wedding theme? We hope you (and Vincent) love it! 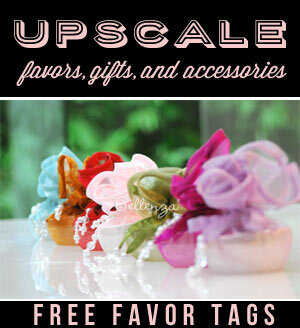 Next Vintage Travel-themed Wedding Favor Ideas with Charm!